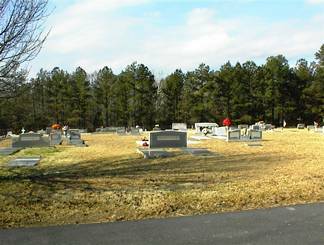 Click here for diagrams of the cemetery and section B. Thank you, Lord, for eight years of happiness with Grace and for receiving her into your Kingdom. "Beloved father, uncle, husband and Paw Paw"
"Bud on Earth, Bloom in Heaven"
On same gravestone as Dora S. Allen. On same gravestone as Charlie J. Allen. "Buddy" "Daddy" On same gravestone as Gladys Allen. "Mama" On same gravestone as Albert O. Allen. "Pop" On same gravestone as Alice A. Dunn. "Mama". No death date. On same gravestone as Lyman A. Dunn, Jr.
"Peace Officers Association of Georgia"
"Joe" On same gravestone as Sara Madgaline Maddox. "Mag" On same gravestone as Edgar Walter Maddox. On same gravestone as John M. Parker. On same gravestone as Jean J. Parker. Pvt U.S. Army Air Corps. Infant grave with only one date. Birth and death assumed. "Daddy" On same gravestone as Lois Beck Meeks. "Mother" On same gravestone as Mark Newman Meeks, Sr.
"Courageous and caring - a man among men, all who knew him called him friend." "Papa" "Papa, we will meet you" On same gravestone as Odessa M. Puckett. "Grannie" "At rest with Papa" On same gravestone as Linus A. Puckett"
On same gravestone as Jossie Renfroe Puckett. "Precious memories" On same gravestone as Clarence Cillus Puckett. "Daddy" On same gravestone as Lena Page Hodges. "Mother" On same gravestone as Wilmer Emmett Hodges. On same gravestone as Betty Zane Hodges Hubbard. "Mama" "God gave, He took. He will restore"
"Our Melvin" St. John 3.16 "What we keep in memory is ours unchanged forever"
"Mama" "Shed not for her the gentle tear nor give the heart to vain regrets, 'tis but a casket lying here. The gem that filled it sparkles yet." "Dot" On same gravestone as Hugh W. Buffington. "Buff" On same gravestone as Dorothy H. Buffington. "Daddy" "To know him was to love him". Fishing rod engraved on gravestone. On same gravestone as Cleta M. Dixon. "Mother" "Weep not for me, all my sorrows have passed. I am where I want to be. Home at last. Home at last." On same gravestone as Rufus T. Dixon. Praying hands engraving. Infant-sized slab with only one date. Birth and death assumed. On same gravestone as Grace Leo Jackson Roberts. On same gravestone as Cedric Guy Roberts. w/o Paul E. Gardner, Sr.
"Daddy" On same gravestone as persons 2 and 3. "Mama" On same gravestone as persons 1 and 3. "Mack" On same gravestone as persons 1 and 2. Georgia PFC Co G. 504 Parachute Inf. "Pete". Engraving of hunting dog on stone. Engraving of lily on stone. w/o Hubert Prosser and Robert H. Herring. Interred Brownwood Cemetery, Sandersville, Ga. "In memory of". Georgia T Sgt 3750 AAF Airbase G.P. "Beloved Husband, Father and Grandfather"
"Beloved Wife, Mother and Mama"
On same gravestone as Betty Smith Simmons. On same gravestone as Harold Randolph Simmons. "We love you Paw & Grandaddy"
"Pop" "Beloved husband & father"
"Mom" "Beloved wife and mother"
"Mama" On same gravestone as Mitchell Coxwell. "Daddy" On same gravestone as Bessie M. Coxwell Raiden. "Doc" "Daddy" On same gravestone as Drusilla Smith. "Sadie" "Mother" On same gravestone as Rawlings Lee Alford. "Mama" On same gravestone as Thomas L. McDade and "our son buried Pierce's Chapel"
"Daddy" On same gravestone as Julia A. McDade and "our son buried Pierce's Chapel"
"In memory of our son buried Pierce's Chapel Dec 15 1940"
Georgia 489 Armd Fld. Arty. Bn. On same gravestone as Evie Garner Kilgore. On same gravestone as John Kilgore. Georgia Pvt. Unasgd Reception Cen. "Father" On same gravestone as Mable B. Meeks. "Mother" On same gravestone as Rufus L. Meeks, Sr.
"Precious Memories, How They Linger"
h/o Bessie K. Davis Farr. He's sleeping in the upper room. "Daddy" On same gravestone as unmarked grave 2. "Our little angel" Only one date on stone. Birth and death assumed. "In loving memory" d/o Horace and Mary Franklin. "Papa". Masonic emblem. Baldwin County deputy. "A wonderful, loving devoted husband and father." b. Cliffe, England, d. Milledgeville, Ga.
b. Plymouth, England, d. Milledgeville, Ga.
Masonic symbol and other symbol with C,F,B and hammers. Masonic emblem and Woodman symbol. "Loving Wife, Mother and Grandmother"
"Beloved Husband, Father and Papa"
s/o Annie R. and Lewis E. Patrick, Sr. Only one date on stone. Birth and death assumed. w/o William E. Fowler. "Mother"
"Daddy" Is Benj. B. Adams III, per Jerrold Wright. State of Georgia faithful service emblem. "School of Nursing P.N." (Milledgeville State Hospital Training School emblem). "Was far too sweet to linger long". Woodmen of the World Memorial. No last name on marker. Carpenter assumed. In group of markers with numbers 1-3. Last name of Carpenter assumed. "Asbestos Workers, Local 48, Atlanta, Ga"
Major U.S. Air Force Nursing Corps. w/o James W. Morgan. DAR symbol. w/o Laurence R. Harrington. "Mother"
God picked a beautiful flower. She's asleep in His everlasting arms. w/o Walter West Cosby. "Mother"
w/o John Martin Cosby. "Mother"
"Papa". Beloved husband of Marie, father of Wytina, Patsy, Robert, Richard. Loving, caring husband, Daddy, PaPa, brother, uncle and friend. Beloved wife of Wyatt, Mother of Wytina, Patsy, Robert, Richard. Loving, caring wife, mother, grandma-Mema, sister, aunt and friend. "Bo". s/o Wyatt and Marie Durden, brother of Wytina, Patsy, and Richard Durden. Loving, caring son, brother, uncle, and friend.